I am trying to configure for attachments. My question is in regards to the table field. How do I know what table to select? I am able to select one and access my files, but I want to understand what is the purpose of this field so I can make sure I am selecting the correct table. The table field is going to tell SL whether the attachments should be related to either the header (Batch) or the detail (GLTran). So the slightly difficult part in knowing which table to attach to is what the underlying table name in SQL is, which is what appears in that table lookup on the setup screen. The easiest way is to utilize Customization Manager (if you have access to it), open up the screen and enter customization mode, highlight a field in the section your interested in attaching files to, then press F4 to view the custom properties. There's a property called fieldname that will usually contain the letter "b" followed by the tablename and fieldname. 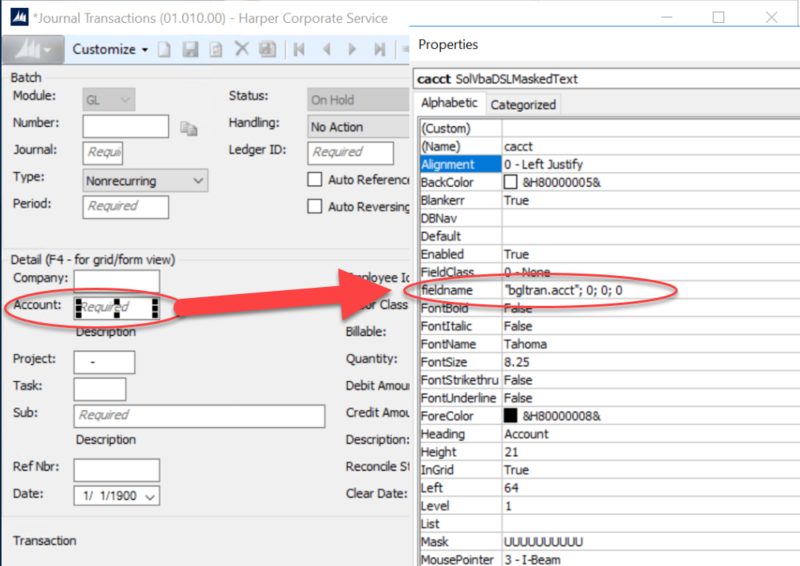 So for the screenshot below of 01.010.00, I've highlighted the account field in the detail section and you can see bgltran.acct which is the table name (GLTran) if we wanted to make attachments relate to detail line items. So back in the setup screen, we'd select GLTran and SL would know to relate the attachments properly. If you don't have customization manager access you can utilize the Report Guides from CustomerSource, the Schema available in Online Help (press F1 in SL), edit a Crystal Report, or come here and post a question. Hope this helps! In the past, I found that the best results were achieved by entering "DEFAULT" in both the Screen and Table fields, populating the "Existing Folder Location:" field, and leaving every other field blank. Then scanning documents and placing them into their proper folders and finally attaching the scanned documents to the SL document as you are entering it. This allows attached documents to "follow" the SL document within the module.